This article explains how to Import and Export WooCommerce Orders by using Order /Coupon / Subscription Export Import plugin for WooCommerce. Please refer to the product page to know more about the plugin features. The WooCommerce Order / Coupon / Subscription Import-Export plugin allows you to import orders from WooCommerce store as well as another e-commerce platform. It exports orders from WooCommerce store to the CSV/XML file. 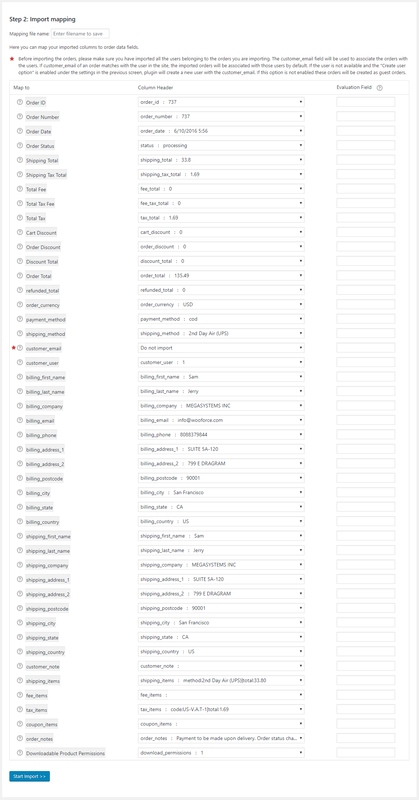 Under Order Import / Export tab, you can import/export/merge(update existing order) hundreds, even thousands, of orders using one file which saves your effort and time of manually adding order information. For importing orders to your online store, you will need a CSV(Comma-Separated Values) or XML (ExtensiMarkuprkUp Language) file which contains information about mapping fields. You can create a CSV file by using a spreadsheet program, such as Excel, or Google Spreadsheets. Save this file with extension .csv. After entering all details about orders in the spreadsheet, you can import orders to your online store. With this plugin, you can also export order details as a CSV/XML file. The plugin takes CSV/XML file as input. It maps each field of CSV/XML file to the field of a particular order. For example, Order_id field gets mapped to the identification number of the order and the shipping_total field gets mapped to the total shipping cost of the order. If you want the plugin to work correctly, you must map headers of all of the column correctly and you must ensure that all of the fields you enter must be in the correct format. Note: While importing, if there is any mistake in your import file, your order import may not work as expected. Also, the CSV Import file must be in UTF-8 format. For more information about UTF-8 encoding, read How to save CSV / Excel File as UTF-8 Encoded? To get started you must have CSV/XML file. You can create the one or export the order to get the format of CSV, download Order Sample CSV. line_item_x Shows the details of line products which includes metadata also. Each row contains the single order. You can import orders from CSV/XML file or merge the orders with already existing orders by importing updated CSV file. Method 1: Select a file from your computer. Click Choose File to browse a required CSV/XML file from your computer. Create User: By enabling this checkbox, if while importing the orders, the user corresponding to an order is not found, a new user will be created. Select a required option from the drop-down list. Here, Order ID is mapped to order_id. For Example: Suppose, you want to assign completed to Order Status. Under Evaluation field, write =completed in Order Status row. For Example: Suppose, you want to add 5 to Shipping Total. Under Evaluation field, write +5 in Shipping Total row. For Example: Suppose, you want to reduce 5 from Order Total. Under Evaluation field, write -5 in Order Total row. For Example: Suppose, you want to multiply to Shipping Tax Total by 1.05. Under Evaluation field, write *1.05 in Shipping Tax Total row. For Example: Suppose, you want to divide Cart Discount by 2. Under Evaluation field, write /2 in a row. To Convert the order date to WooCommerce format, provide your CSV date format in the evaluation field. For Example: In CSV, If you have entered the date in correct PHP format as @ d/m/yy H:i:s ( @ 13/07/2016 4:24:25) , then under Evaluation field, you must maintain the same date format as @ d/m/yy H:i:s in the order_date row. Then the plugin internally converts it in WooCommerce format as 2016-07-13 4:24:25. For Example: Suppose, you want to append Billing Company by Pvt Ltd. Under Evaluation field, write &Pvt Ltd in billing_company row. Note: Hover the mouse on? (Help), you can see the information about Evaluation field. For more information on Evaluation field, See Evaluation field in Order Export Import Plugin for WooCommerce article. While importing orders with the applied coupon, the plugin connects coupon if the same coupon exists in the online store. Suppose your existing order got modified. To reflect that modified order into your online store, you can update the current order by importing the modified order CSV file. This is called a merging of the order. Go to the Import section in the Order tab. 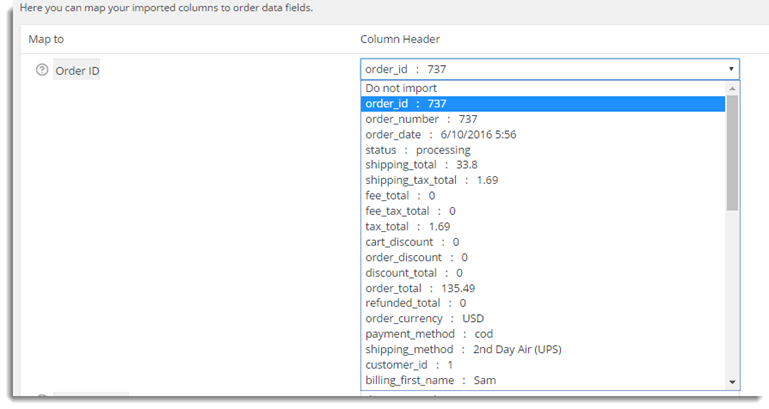 Map the column headers of the CSV file with the order data fields. Note: If Order ID does not exist, then the order is imported as a new order. If you export order using the plugin, you will get a CSV or XML file which contains the data about all the orders of the WooCommerce online store. 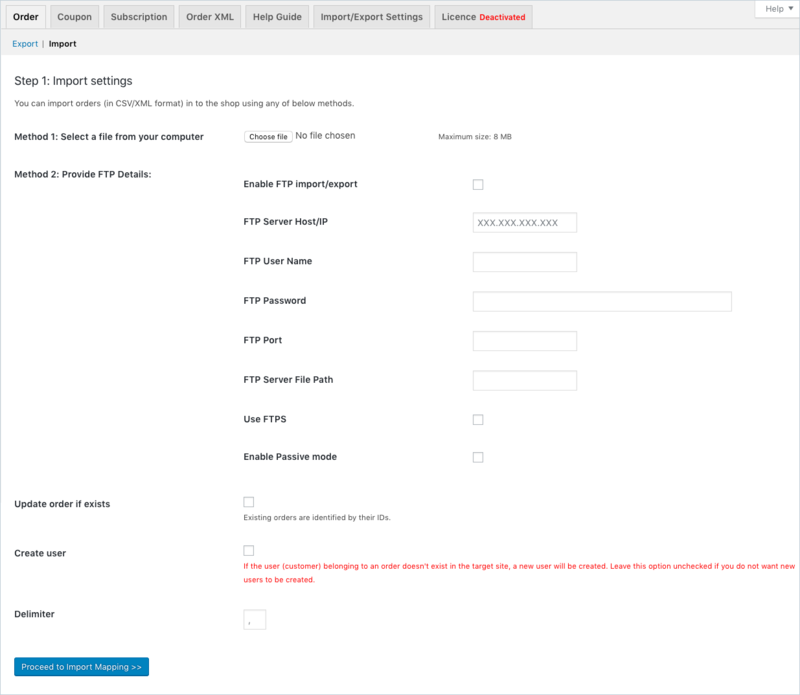 You can also export user role and additional metadata from WooCommerce. To do this, you need to add code Snippets in the child theme’s functions.php. -If you are using Plugin Version 1.1.1, please refer Export Customer Roles and Additional Order Meta Data from WooCommerce article for code snippet and a brief explanation about it. -If you are using Plugin Version 1.1.0 or below, you need to add two separate code snippet to export user role and additional Meta Data from WooCommerce. To Export additional WooCommerce Meta Data, please refer to Export Additional Order Meta Data from WooCommerce. To export bulk orders, select them. From the Bulk Action drop-down list, select Download as CSV and click Apply. All the information about the selected order gets auto-downloaded to CSV file. I have a questions about importing orders that are tied to subscriptions. I know that I’ll need to import any regular orders first (parent orders for subscriptions), however I’m not certain if I should also import “renewal” orders at the same time or if I should import subscriptions (separately), and then import the renewal orders. I’m basically lost on the process for how orders/subscriptions are tied together. Is it that subscriptions are connected to the parent order (and renewal orders to both? ), or that all orders involving a subscription are connected through the subscription. Any help on the process would be appreciated! You may please import all exported orders first and then the subscriptions. Is there a way to import custom fields with an order import? Hello, UPS is asking for which fields to write back to in order to update the orders. Is the import file from UPS worldship expected to update the orders with tracking number details? Or is the import file only expected to update the order status to completed and the tracking information is supposed to be sent from UPS via email? This plugin allows you to import CSV file that contains the Tracking Data of the orders. This way the plugin will update the order to ‘Completed’ and attach the tracking links to the order completion emails that directly goes to the customers.